The last week of January marks a nationwide celebration of freedom of choice in education. People gather to promote the different types of school choice: homeschooling, charter schools, traditional public schools, magnet schools and private schools. 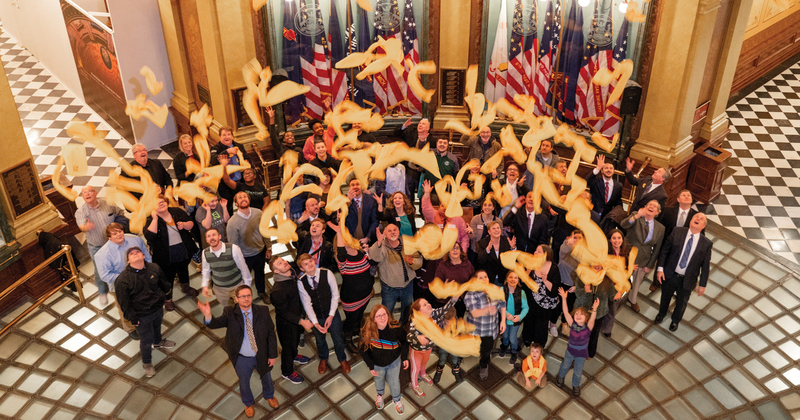 Despite a winter storm, supporters of school choice from around the state gathered to celebrate National School Choice Week at the Michigan Capitol. Mackinac Center employees were joined by parents and students who have exercised school choice, as well as by the educators and administrators who help make education a reality. The event, co-hosted by the Mackinac Center and the Michigan Association of Public School Academies, was the spotlight event of a record-breaking 1,394 events and activities across the state. School choice has long existed in Michigan but was bolstered in 1994 when then-Gov. John Engler signed a law to create a legal framework for public charter schools. As educational opportunities such as online learning and magnet programs have grown, so has choice, which gives parents the freedom to choose the educational path that is best for their children and their families. At the event, we had the privilege of interviewing some students, parents, and teachers, and learned about what school choice means for them. Samantha Roberts, a teacher (and parent) with Iron Mountain Homeschool Partnership, explained how public schools can work with homeschool groups to create a blended educational environment for students. Through partnerships, students have access to Michigan certified teachers in an online program, or they can simply choose to enroll in one of the various electives that are offered, including art, music and culinary classes. The Roberts family participates in the part of the program known as shared-time electives. One of the more unusual interviews was with Ethan, a ninth-grader at Michigan Connections Academy. We spoke to him through an iPad, using the same program that he uses every day for class. Ethan’s been a part of virtual schooling for the past seven years, after going to a traditional public school for a few years. He likes that he’s able to do school whenever he needs to and appreciates that the teachers are always available and willing to answer his questions. Ethan also physically benefits from virtual schooling. Due to some medical problems, it’s best for him to remain at home instead of being in a classroom with additional germs. Education is not a one-size-fits-all matter. Students have different needs, and parents should be able to make decisions regarding their child’s education. National School Choice Week gives us an opportunity to celebrate freedom of choice in education and remember why it’s so valuable.